Yesterday was quite the day for weather in Phoenix tipping the balance from hot urban heat island summer to cool winter. Simply put we only have two seasons here: very hot summer and temperate winter; for all practical purposes we skip the in between seasons. The leaves on deciduous trees don't turn and drop off until late November and then bud green and mature in late March. During four blasting months of summer we get cabin fever in the reverse of colder climates since June through September our temperatures are in triple digits ranging around 110 to 115 degrees Fahrenheit (45 Celsius). We get some rain but due to the urban heat island effect most rainfall doesn't move into the city so we get dust storms instead. Yesterday was a classic shift of weather in from one season to another that occurs with a transitioning storm. In the morning a balmy wind started blowing and the sky was overcast and appeared as if we were getting another mild dust storm. 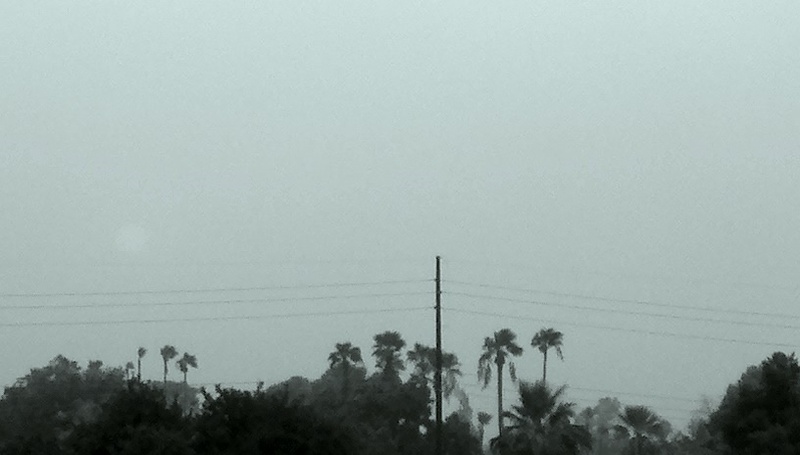 It turned out to be a full blown dust storm by midday slowing and even stopping freeways and enveloping the city obscuring buildings and distant mountains. 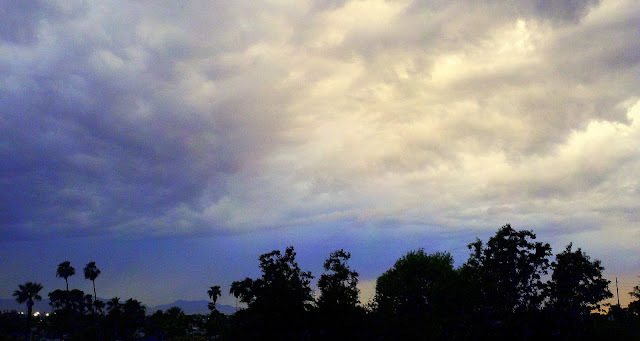 After the storm blew through there was a brief period of weak sun but by late afternoon storm clouds were gathering. Around 17:30 from on top of my roof I could see rain falling in spot cells off in the distance. Then the unique tint that comes from the desert sky when weather is mixing cast over the desert floor in its beautiful way. A little while later came steady rain washing summer's dust and grime off roofs, streets, trees and ground giving everything a good wash down. This storm brought with it cooler air from Alaska no less and we had turned the page from our long parched summer to the fair pleasant cool season starting our winter. All summer scorched time has stood still while we waited for salvation from the weather and now it is time for our winter revival.